"Gerard Armand Demers, Westbrook College, Class of 1978"
Westbrook College student Gerard Armand Demers, Class of 1978, was a Medical Technology major and a Day Hop. For his senior class candid photo, Gerry wore jeans with a long sleeve plaid shirt, and a mustache. His dark hair grew to his shoulders, was feather cut, and parted on the side. 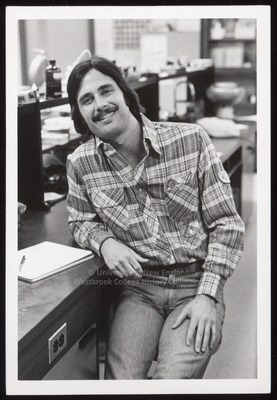 As a Med Tech major, Gerry chose to pose in a Blewett Hall laboratory. He perches on a lab bench and leans on his elbow against the lab counter.